One of the items inside the hamper I won! I am also very interested in the food grinder you've mention, is it really good ah? How does the grinder works? Can grind meat and green vege or not? Sometimes when we cook, the food still not fine enough although in tiny pieces. With this food grinder, while feeding our little ones, can further grind and smash the food into finer pieces, easier for babies to swallow..
maybe you could try making creamy soup with milk. 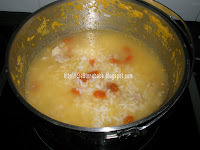 Hi Yatie, thanks for visiting my blog...wanna ask, all ingredients cook together or cook separately then mix it together? Kylie - I never try to add milk into mashed potato. It must be nice!! Good that Sean likes the Chinese Herbs porridge. I like your feeding set, so nice and cute. May I know where you bought the feeding set? Looks like a lot of milk wo, won't it be too watery? Sue, after I smash the potatoes, It become ngam ngam hou... the style my son like, watery a bit... his porridge oso he likes watery a bit 1..